Emergency department (ED) clinicians are in a unique position to interact with people struggling with opioid addiction. Some ED clinicians will see the same patients in their emergency clinics multiple times, often after administering life saving naloxone to reverse an overdose. NIDA has funded research into the initiation of medications for opioid use disorder for addiction to opioids right there in the emergency setting, in collaboration with emergency department specialists at Yale University. The resources below were developed by those specialists, and reflect best practices identified in that research; and offer tools to assist emergency room clinicians. 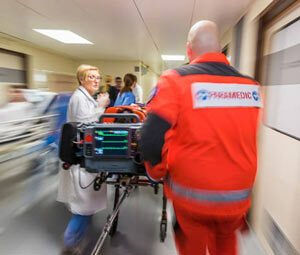 Why the Emergency Department (ED)? That is Where the Patients Are! The opioid epidemic is strongly impacting EDs, with 2018 data from the CDC indicating that there has been a 30% increase in visits for opioid overdose from July 2016 – September 20171. Addiction is a chronic, relapsing disease, and a strongly stigmatized one. It is NOT a moral failing. People who present to the ED for other chronic disease like diabetes and asthma are stabilized with medications and handed off for outpatient care. Individuals with opioid use disorder (OUD) do best with a similar treatment plan. What Do I Need to Know About Buprenorphine? 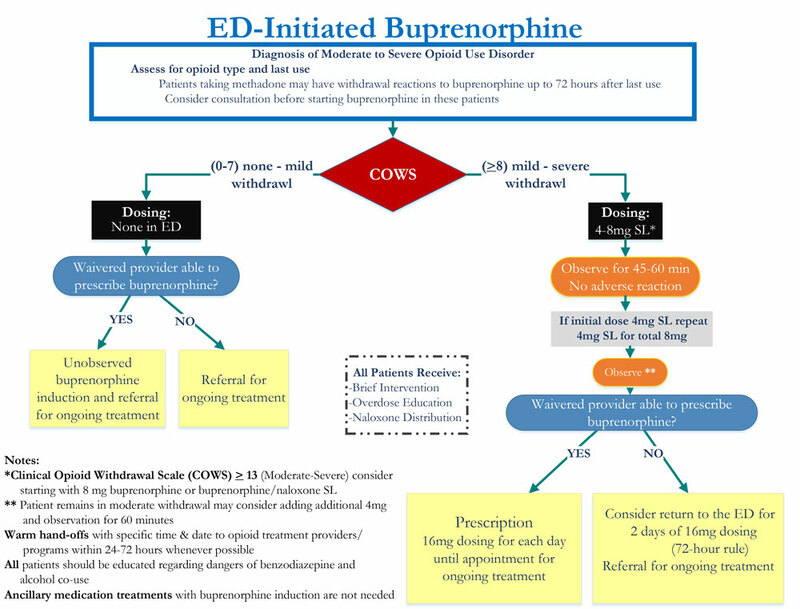 Since 2002 ED physicians can administer buprenorphine in the ED for opioid withdrawal. Within 30-45 minutes patients will be much more comfortable. MDs, PAs and APRNs who complete the DATA 2000 waiver training, can prescribe buprenorphine with referral to ongoing treatment. Buprenorphine is a partial agonist at the mu opioid receptor, where it has a very high affinity but low intrinsic activity. Its high affinity means it will out-compete and displace full opioid agonists. It is administered when the patient exhibits withdrawal symptoms (COWS > 8). Its low intrinsic activity results in less euphoria and lower diversion potential. 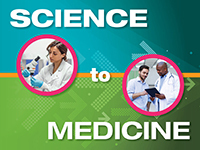 Development of the videos provided below were funded by a partnership between Yale University and Aetna, however, all content and clinical recommendations were developed by clinicians with expertise in emergency department settings, with grant funding from NIDA and contract support from NIDA’s Clinical Trials Network. This information has been provided as a courtesy on the NIDAMED Web portal, and does not constitute official clinical guidelines or standards. Emergency physicians around the country have partnered with state entities to develop a spectrum of innovative strategies. These strategies entail increasing access to care, identifying those at high risk for overdose, safe prescribing, offering access to Naloxone, sharing data among agencies, and decreasing stigma by recognizing not only that words matter, but accurate words matter. Some of these heroes are highlighted in the videos below describing what they are doing to combat the opioid epidemic. Vivolo-Kantor AM, Seth P, Gladden RM, et al. Vital Signs: Trends in Emergency Department Visits for Suspected Opioid Overdoses — United States, July 2016–September 2017. MMWR Morb Mortal Wkly Rep 2018;67:279–285. DOI: http://dx.doi.org/10.15585/mmwr.mm6709e1. D’Onofrio, G., O’Connor, P.G., Pantalon, M.V., Chawarski, M.C., Busch, S.H., Owens, P.H., Bernstein, S.L. and Fiellin, D.A., 2015. Emergency department–initiated buprenorphine/naloxone treatment for opioid dependence: a randomized clinical trial. JAMA, 313(16), pp.1636-1644.